Monday Gangnam City Tour -For new comers of Korean Classes. You can see the most popular sights in Gangnam. 7th Movie Night – (Hollywood movies) – Starts at 7 in the evening at the student lounge. You can bring your own beverages. Liquor is allowed. 14th Sing-along Day – get a chance to listen to the latest K-POP music and sing along together. You can learn useful and practical Korean expressions from the lyrics of the most prequently requested K-POPs. 21th Soap Opera Day – watch popular Korean soap operas requested by students. 28th Korean Movie Day: watch Korean movies with Korean subtitles. 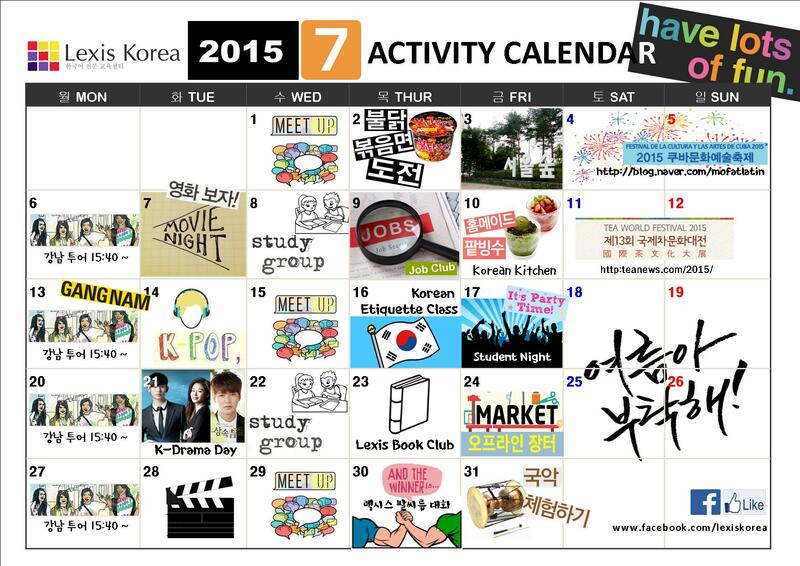 Lexis MeetUp : this conversation club offers international students an opportunity to meet Korean friends. 2nd: bring it on! hot fiery noodles! A competition will be held to students to eat Korean hot spicy noodles. Let’s see who will finish up the fastest. 9th Join the Job club – from 3:40 on ~ till needed, this programme is designed to assist jobseekers to enter/re-enter employment in Korea. Our support team will help you write your CV. 16th Korean etiquette class – you can experience interesting Korean cultures and customs. You will learn Korean manners for everyday life. 23rd Book club – we will guide you to the KYOBO book store. Have a spend spree on books you want to read! 30th Arm Wrestling Competition – at lunch time / in the lounge on 11th floor/ who will be the winner at arm wrestling? 3rd. Seoul Forest – we will go on a picnic to the most famous forest in Seoul. 10th let’s make 팥빙수[Pat bing su] – you can make 팥빙수which is the most popular Korean dessert by yourself. Just give it ago ! 17th Student Night- this is the biggest event of all at Lexis. Both international and Korean students gather together and hangout at pubs around the school. 24th Flea Market – you can bring your items that are no longer of use for you and sell or exchange them with other second-hand items from your classmates. 31st Korean Traditional Music Day – you can try Korean traditional costumes and play traditional Korean musical instruments.